Health Genesis is a specialist USA manufacturer of nutritional supplements for healthcare professionals. 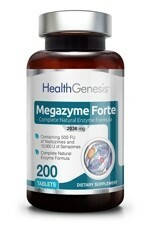 Their FDA cGMP registered facility is perhaps best know for producing the high-dose proteolytic enzyme supplements "Megazyme Forte Plus" and "Megazyme Forte Elite", world renowned amongst metabolic nutritional practitioners for their role in digestive support and broader systemic enzyme health programs. The Natural Choice is proud to make these available within the UK at affordable, discounted pricing. 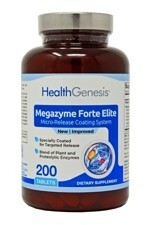 Megazyme Forte Elite is scientifically engineered with an extensive blend of plant and animal-based proteolytic enzymes. This new and improved digestive formula uses a breakthrough proprietary micro-release coating system to ensure that some enzymes are released in the stomach and in the intestines. Enhanced with a wide array of highly specialised enzymes, probiotics and herbs traditionally used to support digestion, Megazyme Forte Elite is designed to help support normal, healthy digestion in addition to other enzymatic metabolic functions within the body. Scientifically engineered with an extensive blend of plant and animal-based proteolytic enzymes, including high doses of Pancreatin, Trypsin and alpha-Chymotrypsin, plus Serrazimes and Nattozimes. This is our best selling enzyme complex and has been designed to naturally support the normal, healthy, digestion of foods and other enzymatic metabolic functions within the body.